Come eat a book. Every year the Friends of Forbes Library holds a fundraiser to support and enhance the library’s services to the community. This year’s Edible Book event happens on Sunday, March 31, 2 – 4 pm at the Florence Civic Center 90 Park St., Florence (next to Lilly Library). 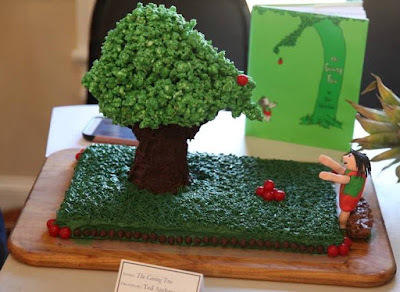 Folks of all ages will come to admire edible representations of books and see them judged by local celebrities. After the judging, attendees, entrants, and judges all get to eat the books! Each edible book is more surprising and wonderful than the next. Entries are always 100% fit for human consumption and demonstrate the maker's interpretation of a book, theme of a story, a specific title or even a generic ‘book.’ Kids often bake and decorate cakes based on their favorite picture books, while adults might go abstract and use more complicated methods of construction. Past entries have included a Catcher in the Rye made out of vegetables, dip and rye bread; an Atlas represented by a globe carved from a whole watermelon; a Very Hungry Caterpillar fashioned from cupcakes; Dr. Seuss’s Green Eggs and Ham made of green eggs and ham; and a fantastical Emerald City from The Wizard of Oz made of green ice cream cones. While most entries come from one or two kids or adults, groups from halfway houses and elementary schools have also collaborated to create their amazing edible entries. This year’s judges are Eliza Cooney, artist and educator; Jeromie Whalen, teacher, media supervisor, and technology instructor at Northampton High School; and Robert Louder, former maitre d' at the Student Prince restaurant, owner of B & B Antiques and manager of Birdstone Antiques in Northampton. Past judges have included Mayor Clare Higgins, actor Kelsey Flynn, radio announcer Bob Paquette, cookbook reviewer T. Susan Chang, River Valley Market manager Rochelle Prunty, City Councilor Alisa Klein, and ice cream entrepreneur Steve Herrell. Since 1999, Edible Book events have been held in places as far-flung as Australia, Brazil, Canada, England, Germany, India, Ireland, Italy, Japan, Luxembourg, Mexico, Morocco, The Netherlands, New Zealand, and Russia. In most cities where Edible Book events are held, the sponsors are art centers, academic institutions, restaurants, and book arts spaces. Northampton was one of the first places where a library hosted the event. The Edible Book binders in the lobby of Forbes Library also contain photos of the past entries, press coverage of the each year’s event and more.